A ten-year longitudinal study of the impact of national, state, and local programs that address issues of digital divide and digital inclusion in Austin, Texas. Over the past few decades, Austin, Texas, has made a concerted effort to develop into a “technopolis,” becoming home to companies such as Dell and numerous start-ups in the 1990s. It has been a model for other cities across the nation that wish to become high-tech centers while still retaining the livability to attract residents. Nevertheless, this expansion and boom left poorer residents behind, many of them African American or Latino, despite local and federal efforts to increase lower-income and minority access to technology. This book was born of a ten-year longitudinal study of the digital divide in Austin—a study that gradually evolved into a broader inquiry into Austin’s history as a segregated city, its turn toward becoming a technopolis, what the city and various groups did to address the digital divide, and how the most disadvantaged groups and individuals were affected by those programs. The editors examine the impact of national and statewide digital inclusion programs created in the 1990s, as well as what happened when those programs were gradually cut back by conservative administrations after 2000. They also examine how the city of Austin persisted in its own efforts for digital inclusion by working with its public libraries and a number of local nonprofits, and the positive impact those programs had. Joseph Straubhaar is the Amon G. Carter Sr., Centennial Professor of Communication in the Radio-Television-Film Department at the University of Texas at Austin. Jeremiah Spence is a Ph.D. candidate in the Radio-Television-Film Department at the University of Texas at Austin. Zeynep Tufekci is an Assistant Professor in the School of Information and Library Science with an affiliate appointment in the Department of Sociology at the University of North Carolina, Chapel Hill. Roberta G. Lentz is Assistant Professor in Media and Communications in the Department of Art History and Communication Studies at McGill University. 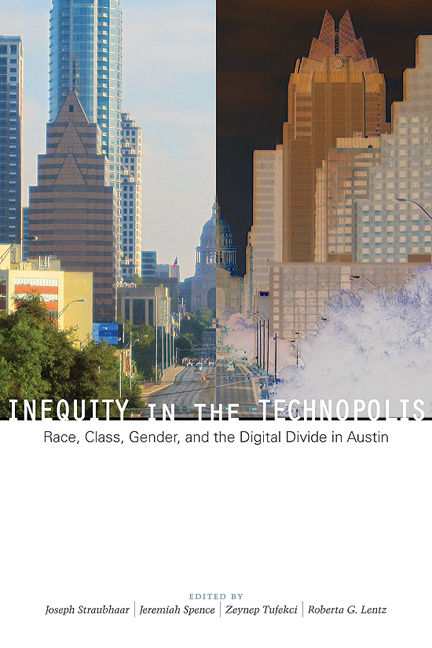 This book comes from a ten-year-long study of the digital divide in Austin, Texas, that gradually turned into a broader inquiry into Austin's history as a segregated city, its turn toward becoming a technopolis, what the city and various groups did to try to address the digital divide once it was identified as a major issue in the 1990s, and how various groups and individuals were affected by those programs, as well as by the larger history of Austin. Austin is widely admired and emulated as a successful example of a technopolis. Often, however, too little attention is paid to the lives of the digital have-nots. This book attempts to remedy this by presenting theoretically informed findings from a ten-year study of the digital divide, or digital inequity, in Austin, covering the period through the dot-com boom and beyond. It examines Austin's turn toward becoming a technopolis by situating it in its history as a segregated city and examines the impact of efforts by the city administration and other groups to address the digital divide. In terms of policy, the book examines the impact of digital inclusion programs that were created in the 1990s nationally and for the state, as well as the aftermath when those programs were gradually cut back by conservative administrations in both the nation and state after 2000. It also examines how the City of Austin persisted in its own efforts at digital inclusion, working with public libraries and a number of local nonprofits, like the Austin Free-Net, and the positive impact those programs had. Theoretically, building on the work of Michel de Certeau the book examines the structuring of cultural geography in the city as planners intentionally structured first a residentially segregated city and then an economic technopolis from above, while other groups and individuals reworked many of those structures from below to make them more livable and equitable. The book also proposes and examines the concepts of techno-field and techno-capital, building on Pierre Bourdieu's ideas of fields of struggle and competition to gain and use resources, like technology access and skills. This book grew out of collaboration between the editors and graduate and undergraduate students at the University of Texas, as well as a variety of groups and individuals around Austin. It was a unique opportunity to study a crucial national, even global, issue in the unique conditions of the city where we lived. There is a tendency to speak of the digital divide, or, more recently, digital inequality, in reference to all things digital. But we want to recognize very explicitly that digital technologies are not a completely new thing. They layer over earlier technologies, and digital skills build on analogous ones learned at home or in the classroom. Further, even a hip, creative city like Austin, considered one of the most wired in the country, has to deal with the legacy of segregation, radically reinforced by city planners in 1928. This book will try to deal with these issues, to see how older layers of history and development affect new efforts and how the many intriguing efforts in Austin to increase access, teach skills, improve learning, and reimagine the economy have worked out. We will look beyond Austin at the broader implications of the interplay of digital media with society, families, and individuals, and within Austin at the policy implications of the information-technology-oriented social and government program interventions. How important are new digital technologies to questions of social change and social equity? How much do the impacts of these new technologies depend on earlier patterns of who got a good education and who did not, who had access to earlier waves of technology and who did not? Many popular and scholarly authors view digital technologies as crucial to an emerging information or creative economy. The focus of Austin planners on information, creative, and high-technology industries has transformed it more than many other places, contributing strongly to the doubling of its population between 1980 and 2005, and to a striking shift in the types of jobs many people have in the city. Austin leaders deliberately planned the transformation of the city into a technopolis—a city whose economy focuses on recent technological developments and industries. It is important, therefore, to think about the impacts of this transformation on all the people of Austin—not just the technologically privileged. As we have thought about how to make sense of Austin's experience, both historical and contemporary, of striving to become a technopolis, and the effects of that experience on Austinites' social and economic well-being, we have considered the city as a complex cultural, economic, and social geography that has built up over time. Parts of that geography were planned from the top down, like the reinforcement of segregation in the 1920s and the planning of Austin as a technopolis from 1970 on. Other parts were structured or planned from the bottom up by nonprofits, schools, and groups operating at a more grassroots level. Theoretically, we want to build on de Certeau's concepts of cultural geography; on Bourdieu's concepts of capital, field, and habitus (1984); on Anthony Giddens's concept of structuration; on Raymond Smilor, David Gibson, and George Kozmetsky's ideas about the technopolis and how it was to be built; on Jorge González's concepts and methods of mapping resources available to people over time, paired with family histories with media and capital (1986); and on Paul Bertaux's concepts and methods of observing family social mobility over time. We also take a critical look at Everett Rogers's theory of diffusion of innovations and the policies that explicitly or implicitly rely on it. De Certeau (1984) argues that the cultural geography of a city is constructed from both above and below. He notes that political leaders, planners, industrialists, and others make many strategic decisions from the top down. The history of Austin features three moments of top-down geographic structuring that had powerful impacts on the city. Austin was structured first as a brand new political capital for the state of Texas in the 1800s. Second, it was structured powerfully as a racially segregated city in 1928. The third major restructuring came in the 1970s with both desegregation (discussed in Chapter 2) and the top-down planning of Austin as a technopolis (discussed in Chapter 3). The remaking of Austin as a technopolis lends the most obvious new shape to the city. However, we will argue that the city is also still profoundly, deeply structured (beneath the visibility of many current residents) by the previous creation of segregated structures of education, work, housing, transportation, and so on from the 1920s to the 1970s, which were not really undone by desegregation after the 1970s. Much of the first third of this book (Chapters 2–4) will directly address these key moments of top-down structuring and their effects on how current Austinites live, work, and go to school. In these chapters, we take a primarily historical view, using maps we found, maps we created from original data (following González's concepts and tools), and considerable economic data about work. There was a fourth key moment in Austin of top-down planning and attempted change starting in the 1990s, aimed precisely at remedying some of the problems caused by the shift to the technopolis economy. At the national, state, and local levels, a number of decision makers, from President Clinton down to the staff of the City of Austin, became concerned that the overall shift in the United States toward an information economy and technology use, accentuated particularly in Austin, was creating a new layer of social stratification between social classes, races, genders, and ages—a digital divide. Chapters 5–7 in this volume discuss different aspects of that analysis and the programs that came out of it. We will look at these issues in a variety of ways, with historical analysis, policy analysis, interviews about the nature of the digital divide, and participant observation in libraries and community centers to see who uses public access. Going back to our theoretical framework, we see that those who live in and use these city spaces make tactical decisions on the ground that can, to some degree, redefine what the place's users do with the space and what practices they evolve. Many people in Austin fought against segregation and worked to undo it, although de facto segregation of housing, schools, work, and access to digital resources remains in many parts of the city. Although the technopolis economy was planned by city, university, and business officials, drawing resources from national planners who wanted to see such development, others affiliated with the city, university, and community were worried about how to implement this idea in a way that mitigated some of its potential downsides. By the mid-1990s, one of their main solutions was to provide computer and Internet access, training, and skills to address the question of the digital divide. Chapter 6 of this book discusses how a variety of groups began to plan and implement local programs, often calling on resources that were becoming available through national and state programs, discussed in Chapter 5. Chapter 7 focuses on how libraries in particular came to be a focus of access to new digital resources and education. Chapter 8 discusses how enthusiasm for wireless Internet began to draw attention away from more traditional community access programs, perhaps reflecting a return to worrying about the young, mobile, creative people who were seen as critical to the technopolis project. Chapter 9 looks at how a variety of people responded to access and training as it became available. All of these chapters in different ways look at what de Certeau would call the structuring or modification of structures from below, by those actually living in the planned technopolis. One of the main questions for this book is how much impact these efforts to structure (or restructure) the technopolis from below, and to make its benefits more widely accessible, actually had on those who needed them most. (Chapters 7 and 9 look particularly at those use and impact questions.) The other main question for this book is how to understand the struggle among a variety of people in Austin not just to gain access to digital tools but also to develop what we call techno-capital (the knowledge and skills required to use digital media capably), as well as what we call techno-disposition (an understanding of digital media's usefulness). Both are discussed below and in Chapter 9. Bourdieu introduces the concepts of field, capital, and habitus to elaborate the continuity, regularity, and regulated transformation of social action, such as technology use by individuals and groups. He describes the tensions and struggles individuals face in their daily life in societies, such as the technological gaps between majorities and minorities. Bourdieu's relational theory, which focuses on the interaction between people (as social agents) and structures (like school systems or the economy), can help us to understand what other factors beyond their economic class operate in the environment in which Austinites live their lives. Bourdieu's theoretical framework, also known as the theory of practice or theory of symbolic power, is based on a distinction between several kinds of capital, notably economic, cultural, and social. Cultural capital, which is separate and relatively autonomous from economic capital, is defined as the possession of certain cultural competencies and bodies of cultural knowledge, typically acquired from parents and schooling, that provide for distinguished modes of cultural consumption. Just as economic relations that express the networks of power are quantified as economic capital, the cultural relations that express different levels of learned and empowering potentialities constitute cultural capital. Cultural capital is distributed differentially throughout society and is accumulated and transferred from generation to generation, just like economic capital. Bourdieu argues that in modern societies, the accumulation of cultural capital requires a long-term investment of time and education. Although they are not reducible to each other, economic and cultural capitals are convertible. Rephrasing the popular idea that education lets people get ahead, Bourdieu would say that education helps one acquire cultural capital, which can be converted into economic capital by, for example, getting a better-paying job using one's expanded knowledge of favored norms of behavior. Bourdieu discusses social capital as resources encapsulated in a set of social relations. The concept refers to "the aggregate of the actual or potential resources, which are linked to possession of a durable network of more or less institutionalized relationships, of mutual acquaintance and recognition—or in other words, to membership group—which provides each of its members with the backing of the collectivity-owned capital, a 'credential' which entitles them to credit, in the various senses of the word". Social and cultural capitals are employed in the reproduction or change of social stratification. They often combine, as when a Harvard degree gives not only an educational qualification but also access to an exclusive social network. Bourdieu uses the term field to account for the concrete social situations within which people as agents operate, accumulating and using different forms of capital. A field is defined primarily by the particular form of capital present and secondarily by the relations developed around it as agents struggle to acquire or maintain that capital. Fields, whether economic, political, cultural, technological, or educational, are hierarchically organized and relatively autonomous but structurally homologous with each other. The economic and educational fields, for instance, are related to each other in the sense that people with economic capital also tend to acquire educational capital, and vice versa. In this scheme, individuals (as agents) act in the different social fields with the capital they have accumulated and used—knowledge, financial resources, social connections, and so on—in the course of their life trajectory. Bourdieu uses the analogy of a game to explain why people participate or invest in a particular "field of forces" in which they compete or struggle for resources, including access to jobs. According to their class habitus, people make specific investments in the fields in which they participate, such as sports, work, education, or computer technology skill. The habitus can be defined as a set of dispositions that generate similar practices and perceptions among members of the same group or class. It is a product of history and is internalized in the mind of the actors. It is an individual and collective process at the same time since it produces individual and collective practices. Members of the same group are the product of the same objective conditions and share a habitus without realizing that their practices are harmonized beyond what they as individual agents know or wish. Habitus, then, implies a certain knowledge and recognition of the stakes in the field and generates the strategies of action with which people participate in the field. As Austin's economy changed toward being a technopolis, the fields of both education, broadly defined, and information technology access, knowledge, and skill became far more crucial to residents seeking to get ahead in life. In the U.S. economy overall, education has increasingly been associated with obtaining better jobs and higher wages over the course of one's life: "In 1975, full-time, year-round workers with a bachelor's degree had 1.5 times the annual earnings of workers with only a high school diploma. By 1999, this ratio had risen to 1.8". Education's importance for workers is even higher in a technopolis like Austin. The importance of technology skills and knowledge has been harder to measure, but a consensus is growing that technology access, disposition (willingness to use), knowledge, and skill are also crucial, particularly in the kind of information, knowledge, and creative industries that Austin has come to specialize in. One could argue that in an economy like Austin's, pretty much all residents are involved in competition in the fields of education and technology, whether they realize it or not. Based on Bourdieu's concepts of capital, field, habitus, and disposition, we identified three interrelated concepts that can help in understanding people's attitudes, perceptions, knowledge, and uses of technologies of information. An individual's relationship with information technology not only depends on how much they know about it or whether they have the resources to access it. People's dispositions to technologies, or techno-dispositions, interact in a reciprocal and complex relationship with techno-capital, a specific form of cultural capital encompassing the acquired knowledge and skills to use information technologies in ways that are considered personally empowering or useful. For example, accumulation of cultural capital related to computers may lead to the formation of techno-capital, which in turn affects one's disposition toward the use of technology. However, if alternative social and cultural influences communicate that computer use is not socially relevant or desirable, then an individual's techno-disposition will direct her or him away from computer use. Both techno-disposition and techno-capital operate within a specific techno-field of human endeavor. In the case of East Austin, where much of the disadvantage in the fields of education and technology is concentrated because of segregation and other historical reasons, the techno-field is the site, or structured space, where struggles over media access are enacted by appropriating resources (access, knowledge, or techno-capital). Techno-dispositions are delineated by such indicators as social practices, perceptions and attitudes, technical education, awareness of technology, desire for information, job requirements, social relations, community interactions, and geographic location. Social practices include an individual's and family's history of technology use, especially the Internet and other information and communication technologies (ICTs), as well as their patterns of mass media consumption (e.g., radio, television, and film).1 Also key are respondents' thoughts and evaluations about ICTs and how they are perceived as a component of individual, family, and community life. Education incorporates both formal institutional education and less formal technology training and vocational studies. Technological awareness refers to the understanding among community members of the potential value of ICTs for economic mobility. Desire for information involves the relevance of various kinds of information and the related use of ICTs to conduct searches in everyday life. Individuals' dispositions toward technology are affected by job requirements and workplace propensities toward ICTs. Social interactions within the community and community organizations themselves, with their capacity to foster an environment that encourages ICT use, may also affect people's techno-dispositions. Finally, the geographic location of the place itself, particularly East Austin, structures the interplay of people's agency with technology through its relative lack of infrastructure and basic resources as a site of struggle over media access. Techno-capital, then, is a product of techno-dispositions that lead people to invest time and energy, or not, in learning about technology. It provides certain competencies and resources to negotiate within the techno-field. As a structured space, the techno-field is analyzed as an arena where human agency is enacted in relation to other social forces—political, economic, social, cultural, and so forth. Techno-competencies, the acquired skills for and knowledge about ICTs, are shaped by the interplay between techno-capital on the one hand and the other forms of capital (social, economic, cultural, symbolic) on the other. In East Austin, the logic of the techno-field is contingent upon the interaction between individual techno-competencies and such social factors as attitudes toward information technologies, minority status, the emergence of Austin as a technopolis (and its attendant need for information workers), local income scarcity, and spotty educational and living standards in different parts of the city. Sources of cultural capital include education, family traditions, and other social resources. Sources of social capital include extended family ties, immigration history, perceived social mobility, community relations and neighborhood interactions, and peer groups. Finally, economic capital is composed of occupation, income, family size, and geographic location. The interactions between these fields of power will be analyzed to bring to light the concept of techno-capital, crucial for reconceptualizing the digital divide in a way that goes beyond physical access to information and computer technology. We looked at this in several ways. We got a baseline for what kind of capital and needs people had by interviewing students and parents in 1999, and a ten-year comparison by interviewing families in 2009. We also did interviews and participant observation in libraries and access centers in 1999, 2003, and 2009 to see who was using computers there. As government programs, local nonprofits, schools, and so on structured learning and access for those in need, we interviewed policy makers and activists, as well as examined documents and news stories, to see what they were trying to provide and why. In this research, we have followed some theoretical and methodological directions not only from Bourdieu but also from Paul Bertaux and Paul Thompson and González, who have elaborated many of Bourdieu's concepts and come up with interesting ways of studying them in practice. We have worked particularly closely with González, adapting methods he and several teams used in Mexico to map out where information and cultural resources were being placed over time. He stresses the value of mapping out both where populations live and where the information, educational, cultural, and media resources that they might seek to use are located. He stresses picking key years that bracket major changes in where the resources are placed to see what is being made available to whom and where. So we picked years before and after segregation was imposed in Austin in 1928. We also picked years (1970, 1990, and 2000) before, during, and after desegregation and the buildup of the technology economy. That enabled us to see how resources available to people, particularly the poor and ethnic minorities, were shaped by planners who were changing the cultural geography of Austin by locating schools, libraries, community centers, and places of work. This is reflected in a number of chapters in this book, particularly in the history presented in Chapter 2. González also stresses that we should look over time and across generations among families and social groups to see how people were using the resources at their disposal. In his theoretical conception, mapping resources and seeing how families used them over time permits an understanding of complex cultural and social practices. In doing this, he builds on the sociology of Bertaux, who used life histories to understand how people acquired the cultural and other kinds of capital they needed to navigate and compete in the fields most important to them. Both clearly build on Bourdieu in their use of fields and capital. We, in turn, use their theories and methods to focus on the fields of new media use, education, language (which has also become a competitive field for Latinos and other immigrants in the United States), and technology employment. Bertaux also worked with Thompson and others to look at factors contributing to social mobility across generations. We used González's adaptation of their methods in Chapter 9 to analyze how families accumulate capital in fields over generations, what their strategies are, and what is passed on successfully, or not, in education, language, and media use. The Technopolis is an innovative approach to economic development that involves linking technology commercialization with effective public and private sector initiatives for economic growth, diversification and global competitiveness. The Technopolis Phenomenon presents ideas, programs and initiatives that accelerate the creation of smart cities, fast systems and global networks. It focuses on the development and implementation of an innovative and effective infrastructure for technology commercialization and economic growth for global competitiveness in the 1990s. In this book, however, we explore the implications for a city or a nation that decides to transition itself into a new type of society, focused economically, socially, and politically on an information or creative economy, fueled in part by industries specifically focused on computers, the Internet, and digital telecommunications. This kind of planned transformation is based on theories of a transition from industrial-type economies, in which earnings are based on capital and labor, to an economy in which information-technology-related skills are most rewarded and provide social mobility, increased job opportunities, and economic benefit to their holders). The creation of video games, digitally recorded music and film, websites, other kinds of software, and various kinds of hardware from chips to computers to cell phones seems, on the surface, like an ideal economic base for a projected information society. Scholars like Richard Florida emphasize that cities like Austin are more correctly seen as creative economies, thus including music, film, and other intellectual or creative endeavors, rather than as information economies per se. By many accounts, Austin is the very definition of success in the modern, information-technology-oriented economy. It has managed to transform itself from a "sleepy college town" in the 1960s to one of the highly touted "technopolises" of the United States. In fact, Kozmetsky, one of Austin's indigenous business intellectuals and the founder of the IC2 Institute (Innovation, Creativity and Capital Institute) at the University of Texas, coined the term technopolis. It has also maintained what many residents consider an excellent quality of life. Named the third-best metropolitan area for businesses and careers in 2005 by Forbes magazine, Austin boasts good jobs, easy living, a mild climate, a lively nightlife with a spirited live music scene, and many parks and outdoor recreation facilities. Florida considers it a prototype of how a city can and should function as a magnet for attracting the "creative class" that drives the current style of creative or information economy. In addition, a number of cities, from Boise, Idaho, to Curitiba, Brazil, have studied Austin as a model for how to become a creative economy city. In 1957, Austin Area Economic Development Foundation created a "blueprint of the future" that set out to recruit industry that matched Austin's existing economic structure. A team of public and private leaders built upon UT's [University of Texas] research programs by attracting manufacturers of electrical and scientific equipment. Austin's success in the 1960s and 70s in making the transition from government to high technology manufacturing was built on the traditional factors of relatively low-cost land, a high-skilled workforce at reasonable wages, and a desirable quality of life. This techno-economic enthusiasm seems to have assumed that changing the Austin economy toward the technopolis model would benefit all, or most. The sectors to be most involved with this new economy in Austin are shown in what Smilor, Gibson, and Kozmetsky called the technopolis wheel. Inherent in the technopolis model is the premise of changing educational requirements, technology skills, and economic rewards in a city like Austin. Daniel Bell's theory of postindustrial society makes specific predictions about the relationship between work, skill, and reward, following from the key premise that information and the tools for accessing and manipulating information form the critical resource, and thus the main path to social mobility. This form of social mobility now stresses overall higher education as well as technology skills. More people will be engaged in information or creative work, which will be better rewarded since it now forms the key economic resource, while blue-collar or other industrial-era skills will be downgraded in importance and less rewarded. One Austin critic of the technopolis model noted in 1991, "Many non-high-tech employees will have a difficult time finding their place on the technopolis wheel. For example, despite the fact the authors consider the research university the 'nucleus' of the technopolis, the only category under 'university' in which students might fit would be 'other'". Further, in the major paper by Smilor, Gibson, and Kozmetsky, there is no mention of income equality or increased breadth of jobs. This is not surprising since most early anticipations of the information economy and technopolis were very optimistic, assuming a positive transformation for all. Only in the mid- to late 1990s did policy planners, like those in the Clinton administration, along with academics, nonprofits, and some in the city government in Austin, begin to worry about a digital divide between those with technology access and skills and those without, those with good jobs in the technology economy and those without. However, there was an assumption that the information sector, at least in Austin, would create new manufacturing jobs as well. In the implementation of technopolis planning in Austin, there was considerable early attention to encouraging high-technology manufacturing plants, such as Sematech or AMD, to locate in East Austin near the African American and Latino communities, in order to make work there more accessible. But not everyone in East Austin considered them a positive development, given that they came with potential pollution from the chemicals involved in chip manufacture. Further, in reality, many of these jobs were deskilled and relatively low paid, as described in Chapter 4. How broadly have gains actually been shared in terms of jobs, income, education, and social mobility under Austin's emergence as a technopolis? Who has been left behind, and how does such neglect occur? How much can be attributed to preexisting disadvantages in education, work skills, income, and geography? For example, while Austin is considered a hip town with a proud music scene and lots of new high-technology jobs, it also still reflects the legacies of racial segregation on the east and southeast sides of town, where black and Latino communities are concentrated and where schools are noticeably worse than those on the west, and largely white, side of the city. One historically black and Latino school on Austin's east side, Johnston High, was one of the first schools in Texas to be closed for poor performance. It is examined in Chapters 2 and 9 of this book to see how its failure can help us understand the persistence of inequity in the Austin technopolis. Beyond historical issues like racial segregation that still affect many in a technopolis like Austin, what are some of the contemporary issues that accompany a technology-oriented development agenda? If information technologies are so crucial to local, national, and even global economies, what happens to people who lack access to them or who don't know how to use them strategically to obtain higher-paying technology jobs? For that matter, how many "good" new jobs have actually been generated in Austin when compared to lower-income service jobs that seem to have grown even faster? These and other questions are addressed in Chapters 2–4 of this book. We focus on the extent to which the Austin technopolis has grown equitably. Is it raising the average levels of education, income, and standard of living? Is it doing the things planned developments are supposed to do? We also examine the impact of a technology-oriented development agenda on education and other public services that affect the general standard of living in Austin. Austin has many faces. It has a growing music and film economy. It has a diverse computer-oriented tech sector that pulls people from across the United States, Europe, and East and South Asia. It has an enormous university, the University of Texas, with over fifty thousand students. For undergraduates, mostly from Texas, Austin offers both a good school and a party environment. For graduate students, from all over, it offers a world-class university. For Latin American immigrants, it offers growing construction and service sectors to work in. For many longer term Latino and African American residents, it offers a conundrum of both opportunity and frustration, as most of the best jobs created bypass them and their children. The average computer-related job in Austin was $100,000 per year in the year 2000. The average wage for workers not in the computer industry was $33,000. And despite the flush economic times that existed in the last part of the 1990s, computer-related jobs have far outpaced other jobs as an engine of growth in the region. Adjusted for inflation, non-computer workers have seen their wages raised by 17% between 1988 and 2000, while computer workers' wages doubled. The year 2000, it turns out, was the best of times. The numbers were much bleaker whenever the economy of the area took a downturn, as it did in the mid-1980s, or after 2000, or again in 2008. Broken down by race and ethnicity, Austin's poverty levels paint a picture of a divided city. Between 1980 and 2007, poverty among white (non-Hispanic) people in Austin tended to go down slightly. Poverty among Hispanics went up slightly during that period, and poverty among African Americans, which declined in the 1990s boom, went up strongly by 2007, even before the Great Recession began in 2008. Looked at another way, the poverty figures show that the technology-economy boom of the 1990s alleviated poverty among all groups, but was unsustainable. Employment went down after the 2000 dot-com bust, when many start-up companies in web services, information technologies, and other new technologies declined or went out of business. This national technology-economy decline hit Austin particularly hard, along with other information-technology-centered regional economies like Silicon Valley. The longer 1990–2007 trend raises the question of how a city can be one of the most successful technopolises of the 1990s and early 2000s, yet maintain such bleak poverty levels? How is it that 2.6 percent unemployment, reached in 1999, was not enough to eliminate or drastically reduce poverty in a city that embraces a development-plan based on information and communication technology sectors—the very industries that are often touted as the most wealth-creating and successful industries? Since then, unemployment numbers have taken a turn for the worse, reaching 4.1 percent in 2008 and as high as 6.1 in 2009 (Texas Workforce Commission 2009). These are still fairly low levels of unemployment, however, and unemployment in Austin has remained below the national trends, so the Austin economy is creating and maintaining more jobs than many others. Yet, as can be seen in the poverty numbers, a large proportion of Austin residents, especially Austin residents of color, continue to live below the poverty level—as high as one in three of African American and one in four of Latino residents. The combined interpretation of unemployment and poverty levels suggests that the technopolis continues to generate structural inequalities and that the rising tide of high-income creative employment does not lift all boats; on the contrary, it may make the lives of low-income residents harder by pushing up property prices and other costs of living. Alarmingly, but not surprisingly, these disparities continue to follow historical trends of racial inequity, with African Americans and Latinos faring worst in the high-tech city. Some of the reasons for the persistence of poverty in the technopolis of Austin may be found through an examination of Austin's history and the structures of race and class that generations of both de jure and de facto segregation have left in place. Another big question for Chapters 2–4 of this book is this: if you create a technopolis in a place that has been previously segregated, how is the technopolis then affected by previous structural issues (i.e., segregation into structured racial enclaves)? Even if the technopolis is planned to respond to and help ameliorate the segregation that was previously imposed, how much of its original impact on education, skills, and so on can be changed? One of the authors, Joseph Straubhaar, got to know East Austin better in 1998 when his two sons began attending two magnet schools that had been placed there as part of the school desegregation plan of the 1980s. He recalls his initial shock at seeing much lower information technology capacities in East Austin schools like Johnston High School and Kealing Middle School than in other Austin area schools, despite the presence of the magnet schools in those two schools. Although public schools had been a target priority for several of the digital divide programs we examine in this book, the public schools were a weak link in Austin's citywide efforts, with clearly unequal resources in East Austin, evident from the fieldwork we started doing in 1999 at Johnston High (reported in Chapter 9). That inequity is intimately related to the history of school and housing segregation in Austin (discussed in Chapter 2). In our interview and observation work with schools, community centers, and other groups in Austin starting in 1999, we discovered that fewer African Americans and Latinos had computers and Internet access. We also initially found lower usage of computers and the Internet and less understanding of the role of new technologies, or techno-disposition, among African Americans and Latinos, although that began to change in the early 2000s. For example, Straubhaar observed an example in 1999 at the Austin public Fourth of July fireworks, one of the few occasions when people of all races, classes, and occupations gather together. He watched a twenty-something Latina sounding out the words on a banner towed behind an airplane over the event that said, "Jobs@Living.com." Quite understandably for anyone not using e-mail or the Internet, she did not understand what the "@" symbol or the "dot" in ".com" meant, so she hesitantly said, "Jobs living com?" This observation is not intended as any slight to her or her family, but it was clear that her schooling and background had not given her the knowledge necessary to understand. By contrast, one could see the advantages, especially for life and work in a technopolis, held by a young mother in a middle-class white family nearby who clearly did understand the message, as she also sounded out the banner: "Jobs at living dot com." Bourdieu would call this a difference in cultural capital: what we have learned at home, at school, at work, and from peers that enables us to compete in competitive fields of endeavor, like education or technology-oriented work, in a rapidly changing society. In the 1990s, the increasingly visible transformations brought about by the widespread diffusion of information technology in the economy and in everyday life led to the theorization that this process could result in the persistence and deepening of inequality caused by a "digital divide." This was a gulf in access to and skills in the use of computers and the Internet, conceived in terms of differentials by minorities, women, older people, rural residents, and those living below the poverty line. A national study at Vanderbilt University found that not only was there a gap between minorities and nonminorities regarding computer and modem ownership and Internet usage, but the gap was greatest among high school and college students. The study also revealed that more than income disparities were at play in explaining the gap. As the Austin American-Statesman reported, "Until now, researchers had assumed any inequality in Internet access could be explained by differences in income and the ability to afford expensive personal computers, modems and online connection fees. Several experts said they were surprised that the racial gap persisted even when incomes were equal". This finding once again highlighted the fact that race could not simply be seen as a proxy for income or class status. It had a particular resonance in heavily segregated places such as Austin. To find and examine the equivalent data for Austin, we did qualitative, in-depth interviews in 1999 and 2009. We drew on the in-depth interviews in Chapter 9 to understand why people were or were not using computers and the Internet, and what kinds of dispositions and capitals they had acquired or were seeking to acquire to navigate the field of information technology in their lives. Most kids would rather grow up to be Michael Jordan than Bill Gates and spend time on a basketball court than in a computer room. . . . Our children should know as much about Paul Allen (the co-founder of Microsoft and owner of the Portland Trailblazers [NBA team]) as Paul Pierce [the Boston Celtics first-round draft pick], and as much about Michael Dell [founder of Dell Computers] . . . as Michael Jordan. . . . And our children should have a shot—better than a three-pointer—at being one of those computer success stories. Thus, from the beginning, the digital divide was pushed to the forefront of the national agenda, with a dual focus on lack of access and differential infrastructure in minority households, and on cultural factors, including dispositions and habitus, that were assumed to be retarding adoption of these new technologies by minorities—as Irving noted about the lack of technology role models. The question of the digital divide rests fundamentally on an understanding of what these new technologies mean. Are they mainly new forms of entertainment, such as television; new forms of connectivity; or essential new economic tools? Most policy makers and social theorists agreed that all three roles apply, with the bulk of the disagreement being relegated to the entertainment and consumer aspects of these technologies. In Austin, as nationally, there seemed to be a near consensus that information technology is essential to economic mobility. Unspoken in the national debate was the implicit assumption that technological diffusion in the workplace was resulting in the up-skilling of labor, an assumption that was to heavily influence attempts to redress inequity and lack of mobility. Chapters 4–5 of this book look at the discourse around that idea. The term "digital" focuses attention on the technological aspects of inequities. However, where one is located relative to this digital dividing line is a consequence of historical and structural factors. A person's family trajectory, access to schooling and subsequent job opportunities, and degree of geographic mobility to pursue opportunities in the "new" economy are all aspects of everyday life that play a role in how interested in and capable one might be in using information technologies. As disparities within the technopolis locally and in the information society nationally became apparent in the 1990s, what were the responses of national, state, and local authorities? We observe how the city undertook providing access and training to digital technologies in Austin. As city, nonprofit, state, and university initiatives attempted to directly affect the development of providing access and building human capital in education and training, were there substantial widespread benefits? How did those change over time? Local organizations actively sought federal and state (Texas) funds. In fact, Austin came to be seen by a number of experts as one of the most innovative sites in the country in terms of programs aimed at increasing what came to be referred to as "digital inclusion." There were very strong Austin programs to provide public access that stood out as models nationwide, as documented by John Horrigan and colleagues and Lisa Servon. There were strong programs early on, by the mid-1990s, in public libraries and some community centers. The team of scholars involved in this book began to systematically examine what had been done in Austin to increase digital inclusion. That is covered in more detail in Chapters 6 and 7. We were very interested in how institutions like libraries were restructured to deal with new roles and tasks as part of the response to the digital divide. Along with the perspectives on de Certeau's ideas about planning and structuring cities from above and below (discussed earlier), we used Giddens's (1984) structuration theory to guide examination of processes by which the connectivity gap is created and perpetuated in the larger political and economic sphere. Giddens offers several useful concepts that help with macro- and microanalysis of how specific policies and institutions might unwittingly contribute to structuring aspects of the digital divide. He sees rules as constraints on, and resources as opportunities for, social actors. One of the first responses in Austin and in most U.S. cities was to turn to city libraries as the primary sites of public access. Initially, the City of Austin and the public libraries formed a partnership with the Austin Free-Net (AFN), a nonprofit organization that provided the connections (with city, state, and federal funding) and did most of the training. The Austin model, as some referred to it in the 1990s, was somewhat more expansive than the focus on libraries that eventually took place in most American towns and cities. AFN also worked with a variety of other community centers, housing projects, job-training centers, and other organizations to try to reach people who did not necessarily go to libraries. One of the first studies that the team involved with this book did in 1999 was to observe who went to libraries and other cities to use public access computers. We wondered whether the libraries were structured to meet the needs of the poorest users and began to realize that many people, including some specific groups, like minority teenage boys, did not find them friendly. We also interviewed librarians and other public access operators in 1999, 2003, and 2009 to see how their programs and ideas were developing. In 2003, at the peak of these efforts, we found there were over forty programs in East and South Austin that worked with disadvantaged groups, from racial minorities to the poor and unemployed to those with physical disabilities, to help them access and learn how to use computers and the Internet. The range and background of those programs is described in Chapters 6 and 7, while Chapter 4 examines one of the training and work-oriented programs in the context of how skill requirements for workers developed in Austin as it turned into a technopolis. From the 1990s on, many skeptics began to comment on such government interventions; several even viewed the idea of specific new digital inequities as insignificant, likely to pass quickly as most people gained at least some access to new digital technologies, at school, work, or public libraries. That skeptical approach has become policy for the U.S. government since 2000 and for many states, including Texas, more recently. Many of the public access programs in Austin were funded by U.S. federal and Texas state programs. They were gradually shut down between 2001 and 2003, which began to limit what the Austin-based programs could do. As federal and state funds began to be withdrawn, because of ideological changes in both federal and state policy, the City of Austin concentrated on public access in its public libraries, which it had its own funds to support. Fortunately, the city's efforts were supplemented by a series of timely grants from the Dell Foundation, which gave computers for online catalogs and access stations, then funding for Wired for Youth centers, and most recently laptops for a library-based laptop-checkout program called Connected Youth. As the issue of subsidizing public access was debated and programs eliminated, other scholars pointed out that physical access to computer and Internet hardware was no longer the primary issue, and perhaps never had been. Jan Van Dijk (2005) pointed out that as the divide between those who do and do not have physical access gets smaller, the divide between those who do and do not know how to use the technology to their own advantage actually grows deeper, with perhaps more severe implications for lasting social stratification. In Austin, it seems that educational divides, income divides, and geographic separation or segregation (by income and race) may actually be growing as the city transforms itself into a technopolis. For example, we began to discover that although local efforts as well as federal, state, and local financing had created a number of access points, many of the poorest, least advantaged people were not using them. We therefore studied several kinds of public access centers and training programs, as well as the recent focus on wireless access, to see what reasons existed for many of those in need not using public access. By 2004–2005, we began to discover that much of the enthusiasm that had once existed for providing access to digital resources, particularly computers and the Internet, in libraries and other public centers was being refocused on providing wireless access around Austin. In Chapter 8, Martha Fuentes-Bautista and Nobuya Inagaki examine that shift of policy attention and resources to wireless access by the City of Austin and many of the nonprofit actors involved in digital inclusion. They also map out where public free wireless was available, as of 2007, and show that it was concentrated heavily in West Austin, and that almost the only providers in the minority areas of East Austin were, once again, the public libraries. One of the key issues touched on in both Chapters 5 and 8 is how technologies spread—how they influence people and their work or education, but also how technologies are shaped by society and by individuals. Chapter 5 takes a critical look at what is often referred to as the diffusion of innovation. In that view, technologies tend to be pushed outward into society by business or government, but are ultimately adopted and used by individuals, who decide when and how to start using them. While accurate in many ways as a description of the process, that analysis has two problems. One is that it places responsibility for learning about technology with the individual, which means that the digital divide or related issues can be seen as the fault of people too lazy or ignorant to take up what is obviously good for them. That ignores many of the problems we have discussed so far, such as structural problems like segregation or widespread, nonvolitional problems like the lack of techno-capital in many neighborhoods and among many specific groups. The other major problem with the diffusion analysis is that it makes the process seem inevitable if one waits long enough, ignoring all the increased stratification and lost access to resources that some groups may have to endure in the meantime as they wait for technology to trickle down to them. However, as explored in Chapter 5, several authors and officials, including some behind the framing of U.S. policy after 2000, thought that it was not up to policy to address problems in the diffusion of innovation, and cut back the resources that had been put into place previously: "On Feb. 6, 2001, Federal Communications Commission Chairman Michael Powell commented on the digital divide by giving the comparison of owning a computer to owning a luxury car. 'I think there is a Mercedes divide,' he said. 'I would like to have one, but I can't afford one'". Clearly in that era, policy makers did not see computers, Internet access, or the education and training necessary to use them as economically or socially important, or as likely to contribute to social stratification in a way that required policy address. Besides looking at the structures providing wired and wireless access, as well as training, we started looking more directly at the reaction of the intended users of these services. Since Austin is a best-case scenario for public access to and education in the use of computers and the Internet, we also had an opportunity to see what problems remained even when the city, state, and various nonprofit groups had created a variety of programs for digital inclusion. Our first initiative in this area was to interview ninth grade students and their parents at Johnston High School in 1999–2000 to see how students and families at one of Austin's poorest and most resource-deprived high schools were using or not using the new digital tools and what they thought of computers and the Internet. We found that very few of the children or parents used computers or the Internet much, although several of the parents did think such use was important for their children's education. One of the ways we came to understand that lack of usage by some was in terms of the need to help them build capacities and cultural capital. Many people we interviewed then and later did not have much understanding of the information or digital economy and how it was evolving. However, one of our studies also showed that many poor people who went through training still did not find jobs in this area because of the limited number of entry-level positions available and the broad array of skills, education, and cultural capital required, beyond computer skills, for such jobs. But trainees did learn valuable cultural capital regarding how to employ information and communication technologies in their personal lives or sometimes in the jobs they did have (see Chapter 4). We returned again to interview people about these issues in 2004–2009. In 2004, we interviewed both majority and minority (African American and Latino) people in Central, East, and South Austin to see what kinds of differences persisted. In 2005, we interviewed more people in these groups in Austin but focused on trying to interview two or three generations of the same families, to see how generations were changing and how much impact family patterns of using media and new media had on the different generations. We found in both years that the same patterns we had seen in 1999–2000 tended to persist. In 2006, we interviewed recent immigrants to Austin, since it was clear that among those who we interviewed in 2004–2005, many suffering the worst divides in access, cultural capital, competencies, and knowledge about how to use information technologies to their own benefit were recent immigrants. In 2009, we did a more in-depth examination of generational differences among three-generation families, comparing Latino, black, white, and Asian populations. This introduction lays out the theoretical schema of the book, introduces the most important historical themes and issues, discusses how we studied them in 1999–2009, and shows how different chapters tie into the overall argument and analysis. The overall theme, guided by theoretical perspectives from de Certeau and Giddens, examines how the city was structured first as a small, segregated political capital and university town, then restructured by a new generation of planners as a technopolis, building on the capabilities of the university and the determination of national and local authorities to retake the initiative (from Japan) in computer and related technologies. In defining the city as a technopolis, planners defined a new field of work, education, and competition for resources focused on technology and related education and skills. To examine what we call the techno-field of Austin, we invoke a layer of theory by Bourdieu, which looks at fields as social spaces where new occupations, new degrees and study programs, new social programs, institutions, and related funding all get redefined by nations, states, and cities in ways that also define and redefine life in Austin, both for those in the new technology economy and those who serve it in other ways. People in the techno-field struggle for cultural capital, which we call techno-capital, that enables them to compete in the new field. They form dispositions to thought and action (or inaction), which makes them more or less competitive. Those dispositions group together among similar people to form what seem like class dispositions, which Bourdieu calls the habitus. As we studied these processes over time in the city, we used mapping protocols and ideas based on González, as well as his ideas on examining social processes via multigenerational interviewing. Chapter 2 by Spence, Straubhaar, Cho, and Graber takes up the story begun here. It focuses on the early history of Austin, before the city focused on the new digital industries and becoming a technopolis. It focuses on the initial crucial structuring of the city by its planners as a segregated city and the lasting consequences that flowed from that top-down decision. It examines how the structure of housing and education evolved in Austin from the late 1800s. It particularly looks at how segregation in both education and housing, most specifically implanted in the 1928 zoning plan, affected Austin's subsequent efforts to develop an economy that required a very educated workforce, a theme also discussed in Chapter 3 by Hartenberger, Tufekci, and Davis. Using maps created for this study, Chapter 2 shows graphically how the changes of 1928 radically shifted the population around, damaging the educational system for Austin's African American and Hispanic minorities in a way that could not really be undone by desegregation when it began fitfully in the 1950s–1970s. After that, Chapter 3 discusses the structuring of Austin as a technopolis, and Chapter 4 by Tufekci examines the unintended consequences, especially for work and education, of that shift. In the process, we examine and critique the theories of work and education associated with the information society by Bell and others, as well as beginning to examine some of Austin's specific efforts to address those issues with technological-skills training. These efforts have begun to constitute a new layer of restructuring, under the name of addressing the digital divide, that responds to some of the new inequalities created by the American information society in general and by the specific form of the technopolis in Austin. The question of the digital divide, how to define it in both academic and policy terms, and how to address it in both policy and programmatic terms by U.S. federal authorities is examined in Chapter 5 by Lenert, Christensen, Tufekci, and Gustafson. Chapters 6–10 address much more specifically the bottom-up response by city authorities, schools, and nonprofits to the social problems of the technopolis, defined in the 1990s as a digital divide, and also address many other related issues. The focus on the digital divide began to change to a focus on digitally related inequalities, which had other (often deeper) roots and implications. So the main programs described in Chapter 6 by Cunningham, Custard, Straubhaar, Spence, Graber, and Letalien as responses to the digital divide shifted somewhat after 2000, in part because of policy and resource changes. To create more locally sustainable programs in computer and Internet access, capability building, and training, the City of Austin refocused on its own libraries, as noted in Chapter 7 by Lentz, Straubhaar, Dixon, Graber, Spence, Letalien, and LaPastina, while local nonprofits like AFN, senior centers, public housing centers, and church programs managed to hang on. As Fuentes-Bautista and Inagaki show in Chapter 8, city and local activist attention shifted somewhat as the field of access to the Internet was redefined with a new focus on creating wireless access (Wi-Fi), which is of much more use to creative professionals and students with laptops than to the poorer, minority-centered clientele of the public access programs at libraries and centers. Chapter 9 by Rojas, Straubhaar, Spence, Roychowdhury, Okur, Piñon, and Fuentes-Bautista returns to the Bourdieu-related perspective on how people in Austin navigated the new, rapidly emerging and changing field of technology and the related field of education. This chapter elaborates and develops our own ideas about techno-field, techno-disposition, and techno-habitus. Comparing 1999 with 2009, we found that techno-dispositions and group techno-habitus were changing rapidly. Many minority youth who might have been wary of computers in 1999 were caught up in the youth generation's turn to digital technologies by 2009, even though they still lacked much of the techno-capital that many more-advantaged youth had. Finally, Chapter 10 by Straubhaar draws conclusions about what the history of the technopolis has to tell both those who live there and those who are interested in understanding the larger global phenomenon it represents. It also examines some of our key theories to determine how useful they have been in our quest to understand the various structurings, restructurings, and responses from below by the key actors and agents in the city's history.